When the nutrients provided by the seed have been exhausted, which is about the time a young seedlings first true leave appear, they require small amounts of fertilizer. To ensure good strong healthy seedlings you are going to need to start a regular fertilizer program. This first fertilizing is especially important if you're using a sterile soilless seed starting mix. Because vegetable seedling are only being gown in pots (inserts, trays or whatever you are using) for a short time compared to permanent potted plants, their fertilizer requirements are more immediate. They don't have the time to hang around waiting for slow release fertilizer to give them what they need, they want it fast and they want it now!! Soil temperatures are important when fertilizing seedlings. Cool soils can suppress nutrient availability to plants in general and seedlings are no exception. Even if you are using a potting mix that is not sterile and has microbial action going on within the mix the activity of these microbes decreases greatly in cool soil temperatures. If the soil is cool enough even liquid fertilizers may not help nutrient uptake. There are two ways to help in controlling soil temperature for your young seedlings to ensure fertilizer uptake is not only possible but the best it can be. Making sure the water you use is room temperature helps to avoid cooling the soil to much. Tap water is usually well below room temperature especially in late winter early spring when most seedling are being grown. Set the water out to warm it up or mix cold water with some from the hot tap. Using heat mats is another way to warm the soil and keep temperatures at optimum for good seed germination and seedling growth. While liquid fertilizers are at the top of the list for fertilizing seedlings it should be realized that seedlings roots are very delicate. They do best with frequent light feedings of liquid fertilizers rather than heavier applications less often. Even when using organic liquid fertilizers it’s important to begin feeding with a diluted fertilizer solution, increasing in strength as the seedling develop. In line with keeping it simple there are only two liquid fertilizers I put at the top of the list for seedling fertilizer. The first is fish fertilizer, the second, and equally as good is a tea made from worm castings. 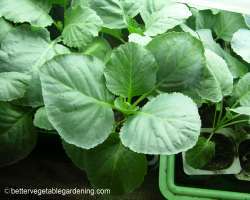 A combination of the two liquids half and half is my very favorite secret recipe for growing seedlings that surpass all others. Fish fertilizer is one of the top seedling fertilizers to use in potting mixes once the seedling have developed their first true leave. It is also one of the nutrients that needs to be well diluted before using. Just because it’s organic don’t think it want harm your plants if applied to strong. Half the recommended dose for house plants is the usual amount, which is about 1 teaspoon per gallon (3.75 liters) of water. Fish fertilizer should not be kept for more than a day once mixed so only mix up as much as you need for the immediate application. Not all fish fertilizers are born equal, it is best to use hydrolyze or enzyme digested fish fertilizer product rather than fish emulsion. Go to my fish fertilizer page for more information on these products. 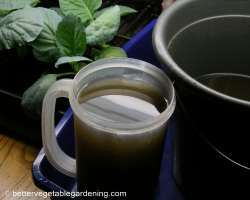 Worm casting tea, this simple passive nutrient tea is another excellent organic seedling fertilizers. Mix 1 cup of worm castings, either purchased or from your own worms, in 1 gallon (3.75 liters) of water. Leave the brew to soak until the water turns to a medium brown color, usually 24 hours is enough. You can then use the water to fertilize your seedlings once a week. When applying the tea stir it up so any residue is applied along with the tea, every little bit counts. The main problem with solid organic fertilizers, when using sterile soilless potting mixes, is the availability of potassium and phosphorous. When there is no microbial action going on, as in sterile mixes, these nutrients are not going to be available to the seedlings. Nitrogen, on the other hand is seldom a problem as there are countless fast acting, plant ready nitrogen sources available. Vermicompost or worm castings are one of the few organic sources of water-soluble, plant ready nutrients available for growing seedlings. Why go past the best when it produces results. 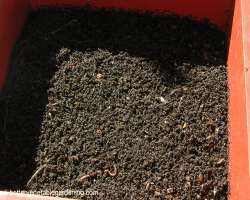 Vermicompost, worm castings, worm compost, worm humus or worm manure call it what you like. It is an excellent nutrient source for fertilizing seedlings. Not all situation call for starting seeds in a soilless potting mix, if you are starting seeds in pots from the beginning it is best to use a potting mix that has fertilizer added. 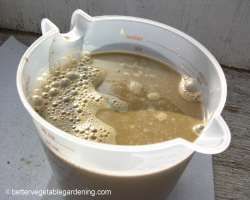 Mixing 10 - 15 percent vermicompost or worm castings, approximately 1 1/2 - 2 cups per US dry gallon or 1/2 - 3/4 cup per liter, to your potting mix before you start is one of the best ways to achieve this. 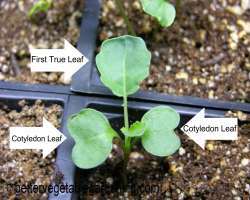 Using the same amount of vericompost as above, mix it into your potting mix when pricking out and re potting your seedling at the first true leaf stage. As your seedling grow feed them liquid fish fertilizer, worm casting tea or a half and half mix once a week. This will normally get your seedling through to the transplanting stage. However if you continue to grow you seedling in pots past the 5-6 true leaf stage it is advisable to re-pot again using a fresh batch of worm castings or give them a boost with liquid fish fertilizer. For more on Vermicompost follow this link.